Dr. Weeks’ Comment: Only the pig and the human spoil their own environment… all other animals act symbiotically. Evidence continues to mount that a highly controversial class of pesticides blamed for widespread bee declines is also harming other creatures, perhaps catastrophically. In a study of neonicotinoid pesticides and bird populations in the Netherlands, biologists found a close and troubling link. As neonicotinoid levels rose in streams, lakes and wetlands, populations of insect-eating birds declined. The pesticides appear to have eliminated the insects on which they rely. “These insecticides appear to be having more profound effects than just killing our pollinating insects,” said ecologist Caspar Hallmann of Radboud University in the Netherlands, an author on the new study, published today in Nature. Hallmann and his colleagues analyzed two long-term, Netherlands-wide datasets: one of bird counts, and the other of surface water measurements of imidacloprid, the most common neonicotinoid. First introduced in the 1990s, neonicotinoids have become ubiquitous in agriculture and gardening, and in recent years have been identified as a cause ofdramatic die-offs in domestic honeybees. They’re also likely contributing to widespread declines in wild bees and butterflies. Effects on other creatures, though, were long thought to be minimal. Early toxicity tests suggested that risks to vertebrates were fairly small, and the compounds weren’t expected to accumulate in the environment at levels capable of depleting non-target insect populations. That rosy picture has lost its glow. Researchers have questioned the usefulness of those toxicity tests; they’ve also found unexpectedly high levels of neonicotinoids in rivers, lakes and streams. There they can poison aquatic invertebrates or be absorbed by plants, eventually harming plant-eating insects. Surface-water pollution by neonicotinoids has been linked to declines in invertebrate populations. The focus on bees “has missed the bigger picture,” wrote Dave Goulson, a biologist at the University of Sussex, in a commentary accompanying the study. And what’s been missing from the science of that bigger picture, he wrote, is the next logical piece of evidence: that unintended effects on invertebrates can ripple up the food chain. 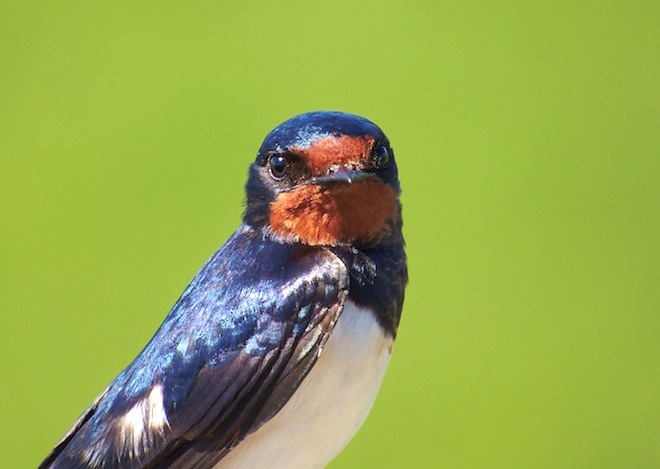 In the new study, scientists found that in 14 out of 15 insect-eating bird species””most of them well-known, including barn swallows, tree sparrows, common starlings and a variety of warblers””the presence of neonicotinoids was associated with population declines. Above a surface water level of .0194 parts per billion, which was found in most of the Netherlands, populations shrank at an annual average of 3.5 percent between 2003 and 2009. The results “suggest that neonicotinoids pose an even greater risk than has been anticipated,” wrote Hallmann and colleagues.In a statement issued by neonicotinoid manufacturer Bayer, the company said the new study “provides no substantiated evidence of the alleged indirect effects of imidacloprid on insectivorous birds,” and that it “does not demonstrate that there is a causal link.”The researchers acknowledge that correlation isn’t cause, but note that the findings fit with what’s predicted from the larger body of evidence. The researchers also looked for strong associations with changes in land use, such as urbanization, that are known to affect bird populations. They couldn’t find them. In that light, the case for harm is “made more convincing,” Goulson wrote. Conservation biologist David Gibbons for the Royal Society for the Protection of Birds, who recently co-authored a review of neonicotinoid effects on non-target animals, also found the study convincing. “Until this paper, the risks to bird populations from neonicotinoids was possible, even probable, but still remained only theoretical,” said Gibbons. “Their paper has shown that impacts are probably real.”One of Gibbons’ co-authors on that neonicotinoid review was ecotoxicologist Christy Morrissey of the University of Saskatchewan, whose work in Canadian farmlands suggests similar trends. “On the whole, the evidence is growing that neonicotinoids are exerting effects beyond pest species,” said Morrissey. “There are real conservation concerns for species beyond bees.”Across North America, birds that live in or migrate through agricultural areas arein precipitous decline. And while an analysis like the new study would be difficult to conduct here””there are no long-term, large-scale datasets of environmental neonicotinoid levels across the U.S. and Canada””neonicotinoid pollution levels are routinely found that exceed the new study’s .0194 ppb limit.“There’s no reason to believe that the situation is drastically different,” said study co-author Ruud Foppen, an ornithologist at the Sovon Dutch Center for Field Ornithology. The researchers also point out that, aside from eliminating their food supply, the chemicals may also be poisoning birds””not necessarily killing them outright, but rather weakening them. That remains an area in urgent need of more research, they said, and something for government regulators to consider. While neonicotinoids have been somewhat restricted in the European Union, they remain widely used there. In the United States, the Environmental Protection Agency plans to complete its review of neonicotinoids by the decade’s end. Those reviews, said Gibbons, should not be conducted as they’ve been in the past. Wanna learn a new language? FDA failure again -thought you would want to know.